Mid-charm and protestations of innocence is when an assassin attacks with a machine gun. Maze responds with a knife. An unfair fight - Maze is Maze after all. But Rivers is shot and Maze turns to the only doctor she knows to help treat him - Linda. And Maze is the most hilariously awful doctor in the world - but he shows how tenderly she handles him (after her fashion) which worries Lucifer (“he broke my Maze!”). He was very certain that Maze wouldn’t be hurt by Rivers, he never expected her to go all gooey and soft over him. In classic Lucifer fashion, he is now convinced of River’s guilt (because Lucifer is quick to hate anyone who seems to challenge his life, world view or even resembles someone he doesn’t like) while Chloe is changing her tune and trusting Maze. Which means following up on her suggestion that Rivers may be innocent. Ok I’m not really following or agreeing with this. Deciding it’s ok to trust Maze and respect her when she declares someone innocent when, let’s face it, investigation is not exactly her strongpoint - I can see...ish. But after already failing to trust her when she says she’ll be ok when violence and mayhem most certainly are her expertise. If Maze says “I’m fine, he can’t hurt me, trust me” then I’d trust her there. 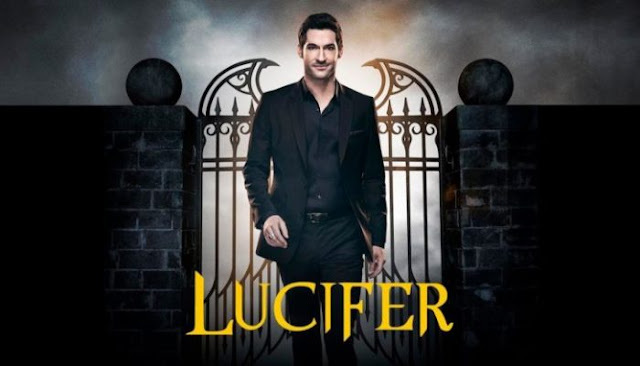 Chloe gets suspicious and speaks to Lt Herrera and does her own investigation, which only makes her more suspicious so she teams up with Lucifer to ask more questions and reveal Lt. Herrera is the real mastermind behind the murders Rivers is accused of. Back in Canada, Daniel catches up on Maze (he’s on the way to Hawaii on holiday mainly because Lucifer wants to mock him) and while they argue what to do, River escapes. Then Maze ditches him when he suggests calling the Canadian police. Poor Daniel - I really do hope this season decides to stop making him the whipping boy for everyone. Maze catches up with Rivers - second to the assassin and three goons who are all ready to kill him. 4 gun wielding goons vs Maze… well there’s Rivers and Daniel as well, but really it’s Maze who tears a hole through them because she’s Maze. Daniel is useful in covering it all up and explaining things to the Canadian authorities. I’m not sure how he explains it but he does.